Crown Casino in Melbourne is not only Australia’s premier land-based gambling venue, but the largest gaming complex in the entire Southern Hemisphere. As such, you would expect it to be a mecca for the most popular casino game in the world: real money blackjack. However, the Southbank establishment – along with its sister site at Burswood, Perth – has become something of a no man’s land for players of 21 in recent years, due largely to the introduction of a controversial format known as Blackjack Plus. Let us show you why this is one game Aussie blackjack enthusiasts should look to steer well clear of, and what alternatives we might consider instead. Blackjack Plus tables began to appear at Crown around 2011, and have since replaced most low-to-medium limit 21 games on the casino floor. But what is it about this particular style that has so infuriated punters and anti-gaming spokesmen alike? For starters, the 3/2 payout on a natural 21 is a significant improvement on the 6/5 return found in many Australian blackjack games. The fact all 21s and five-and-under hands win immediately is another big yes that was previously hard to come by. But all these player-friendly rules are made redundant by one big, fat stinker: the dealer cannot bust with 22. The first time we here at Blackjack.com.au came across this rule, we were gobsmacked. Try explaining it to someone from overseas, and they will look at you like you’ve told them their dog just died. For in a game built around the premise of scoring 21 or less, how on Earth can the house be allowed to stand off with 22? It makes no sense. And here’s the fun part: how does the 22 rule affect the house edge? Well, the original Crown Blackjack game bore a theoretical return of around 99.44 per cent – i.e. playing with good strategy, we could expect to regain about $99.44 of every $100 wagered. With Blackjack Plus, that figure sinks as low as 97.14 per cent when using a full shoe of eight standard decks. In the blackjack world, where the casino’s mathematical advantage is often less than 0.50 per cent, a house edge of 2.86 per cent is extremely high. But what’s an extra $2.30 out of every $100? Think about the big picture here. This is not just your money, but every dollar spent on Blackjack Plus. 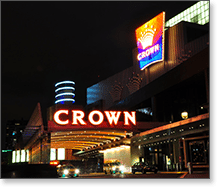 If 1,000 punters gambled an average of $100 each, Crown could statistically expect to rake in over $28,000 – and that’s assuming every player is clued up and using basic strategy, which is incredibly unlikely. In the old 6/5 blackjack, that figure would be under $6,000. So, to sum up, Blackjack Plus is a gross perversion of the game of 21 and should be avoided like the plague. Unfortunately, if you can’t afford to bet $100 per hand, you may find that your options at Crown Casino are very limited. If you’re one of the lucky ones with a bankroll to burn, you can sidestep the BJ+ tables altogether for more traditional (and much fairer) variations on the grand old game of 21. You may find a few low-bet tables for these game styles, but as a general rule you should expect to pay a minimum wager of $50 or more per hand. This used to be the stock-in-trade before the scourge that is Blackjack Plus took hold on Southbank. It uses conventional Australian rules, with a 6/5 payout on natural blackjacks, no hole card for the house, and the dealer hitting all soft 17s. The house edge for Crown Blackjack is around 0.56 per cent. If you have the cash and the clout to hang with the high rollers in the Mahogany Room, you might just find a halfway decent Vegas Blackjack table. This is as close to Nevada rules as you will get in Melbourne. The dealer takes a hole card (as is standard in the US), splits and doubles are allowed, and you have the option to surrender half your initial bet when the house’s upcard shows 10 or Ace. This is a distinctly Aussie blackjack variation, and probably your best chance of finding a low minimum bet limit outside BJ Plus. Crown Pontoon uses up to eight modified decks with all face-value Tens removed (i.e. there is no Ten of Clubs, Ten of Spades, Ten of Diamonds, or Ten of Hearts, for a total of 48 cards per deck). Naturals pay 3/2, and there are various bonus prizes for hands of 7 7 7 or 6 7 8 – including a Super Bonus of up to $5000. Crown also offers 6 to 5 Pontoon, with a decreased payoff for naturals. A handful of Crown’s blackjack games will offer side bets. These wagers are independent of your initial blackjack bet, and can be made on a specific set of incidental outcomes that might occur within the player’s hand. Below are a few sidebet options you might find on any of the available 21 games at Southbank or Burswood. Be warned: these wagers come with a big house edge, so we suggest avoiding them unless you’re feeling extremely lucky. Crown Suits: Wins at 2 to 1 odds when your first two cards are of the same suit. If the dealer’s card is also of the same suit as your first two cards, the wager pays 5 to 1. This is one of the more winnable blackjack side-wagers out there. Perfect Pairs: Pays off when your first two cards turn up a pair. Exact payouts vary depending on the number of decks used and the specific form of 21 being played. In Crown Blackjack with eight decks, a mixed pair (different suits and colours) pays 6 to 1; a coloured pair (same colour, different suit) pays 12 to 1; and a perfect pair (same colour, same suit) pays 25 to 1. The house edge here is 4.1 per cent, but it can go as high as 12 per cent in Crown Pontoon. Magnificent Sevens: One of the most tempting blackjack side-bets, with a maximum payout of 16,000 to 1 when you draw three Sevens in the same suit. You can also salute with off-suit Sevens (50 to 1) and suited Sevens (150 to 1) on your first two cards, as well as 7 7 7 in mixed suits (up to 950 to 1). Blackpot: A semi-electronic blackjack variant, where players can place side-bets on a two-hand progressive jackpot using digital betting devices. If you draw a hand of 6 7 8 (pays 100 to 1) when playing the side-bet, you can then press the wager into the next hand and play for up to 20,000x your initial wager. One part of the Crown Casino which makes up for the terrible Blackjack Plus variant is Crown Rewards. This is a loyalty rewards program which is free to sign up for (either online or through the help desk at the casino) which grants members points for every transaction made within the Crown Entertainment Complex in Melbourne (and Crown Perth, if you play 21 there). Use your card while playing blackjack at the tables, electronic blackjack or any other table game or pokies machine and you will gain points, which, when saved up enough, can be redeemed for freebies and experiences. Examples include: Crown gift cards, movie tickets, free parking, birthday offers, hotel discounts, grand final experiences and helicopter tours. To gain the maximum rewards, it also pays to be a CrownBet.com.au member as well, as the Crown Rewards program ties in with every wager you make with your Crownbet account – make sure to link your Crown Signature Club Card to your Crownbet account first to ensure points are correctly awarded each time to place a bet. For a full comprehensive break-down of what CrownBet Rewards entails and what kind of things you can redeem with the points, check out our in-depth guide to the CrownBet Rewards program. We’ll be blunt: if you’re not playing at least $50 a hand, most of the live blackjack games at Crown Casino are a rip off. From a purely statistical point of view, every gambler is better off playing 21 over the Net – and that’s not taking into account all the added perks of online casino betting. Play from home, avoid the crowds, and save money on extortionate cab fares, all while enjoying a far greater range of real money blackjack options than you would find at any land-based casino. Unfortunately, online gambling is illegal in Australia as of September 2017 following the introduction of the Interactive Gambling Amendment Bill 2016, so online play is available for international readers only. For the best blackjack games on the Web, we recommend All Slots Casino. Enjoy over 40 varieties of the world’s most popular table game, including live dealer blackjack, hi-stakes 21, and real money mobile blackjack. And that’s just the tip of the iceberg, as players can choose from over 500 Web-based casino games all up – from 400+ online slots and progressives, to real money roulette and baccarat, to video poker, instant-win scratchies, bingo, and much more. All Slots is fully approved by eCOGRA (eCommerce Online Gaming Regulation and Assurance) for safe and honest digital gambling practices, while its world-renowned Microgaming casino software ensures the highest standard of interactive gameplay. Register today at www.AllSlotsCasino.com – our number one website for real cash online blackjack.